Have you ever bothered to export your music from one computer to another or transfer song files and playlist information to another application? The playlist export and import functions can also be used to move a playlist from your iOS device to your PC's iTunes library. 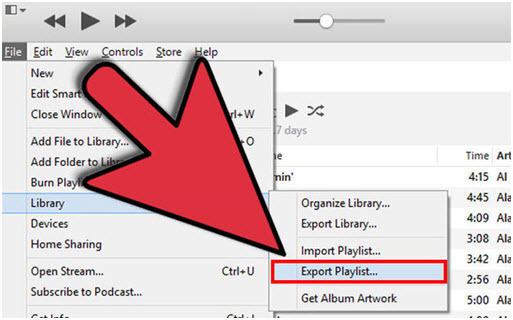 Part 1: How to Export iTunes Playlist through iTunes? Part 2: How to Export iTunes Playlist Using Drag and Drop? Step 1: Pick the playlist in iTunes music application that you want to export. Step 2: Click the "File" iTunes app. Step 3: Select “Library” > “Export playlist”. Then choose the location to save the playlist file. Step 4: Select the "Save as type" menu to get the format options. Step 5: Choose a playlist file name and save it. Choose the "XML" file format if there is a plan to import the playlist back into iTunes, such as when you're moving a playlist from your iPhone, iPod or iPad to your PC or sharing it with a friend. Choose the "M3U" file format if you are importing the playlist into a program like Winamp or MediaMonkey. Part 2:How to Export iTunes Playlist Using Drag and Drop? On the subject of transferring songs out of iTunes, song files can be selected, dragged and dropped from iTunes to a Windows OS or Mac window and copied to a destination folder, which is a much easier method. Nevertheless, the drag and drop method does not create an “M3U” playlist file format unlike the iTunes Export. The drag and drop is useful for shorter song playlists. Creating folders help to organize song files. 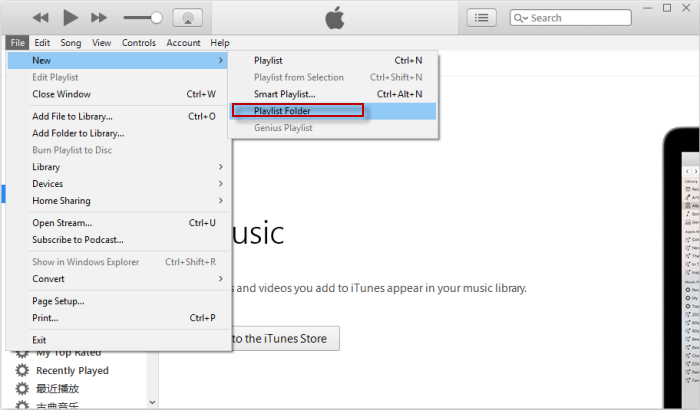 Below are the steps to guide on how to drag and drop iTunes playlist in to a folder. Step 1: Click the "File" in iTunes. Then click “New” > “Playlist Folder”. Step 2: Rename the Folder and return. Step 3: To add items to the folder; drag and drop playlists or other folders into the new playlist folder. To move a folder out of another folder, drag the folder towards the left edge of the iTunes window. Export iTunes list using the iMyFone TunesMate is a much better option and probably the most efficient. The software offers more flexibility, it is able to transfer any kind of files, editing of playlist is possible and fast, there are no restrictions unlike apple iTunes. Selectively export iTunes playlist fast and easy to different iOS device. Fully compatible with iOS 10.3 and later versions. Two way transfer between iPhone and iTunes for music/videos/photos. Export purchased or non-purchased music from iOS device to iTunes/PC. Keep the original iPhone data while export. Step 1: Download and install iMyFone TunesMate on your PC, connect your device (iPhone, iPod, iPad) to the software. Step 2: Select the “Music” tab, and opt the playlist that you desire to export. Step 3: Click “Export”. Then choose “Export to PC” or “Export to iTunes”. If you choose “Export to PC”, you need to opt a location where you wish to save the playlist. If you choose “Export to iTunes”, syncing will start immediately. How to Export Text Messages from iPhone to PDF?